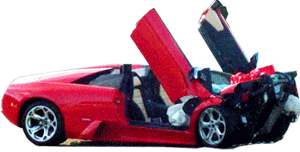 A mechanic from Miller Motorsports was driving a customer's Enzo. He attempted to enter a freeway onramp in Stamford, CT, but he lost control, fish-tailed, and crashed into the median facing the wrong way. Michael Fux, the owner of the Enzo, reportedly owns 129 cars, including 25 Ferraris, so he won't be missing this one that badly, even though it's worth over $1.6 million. Only 400 Enzos were ever produced, and this marks the 25th accident involving one.